Priced below Jan 2019 appraisal for breathtaking long-range mountain views and overlooking Burnett Reservoir and the Blue Ridge Parkway! 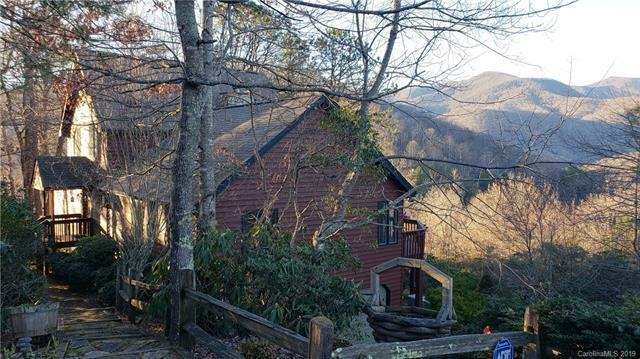 5 min drive to downtown Black Mountain,20 easy mins to Asheville NC. Granite and stainless in the kitchen. VIEWS FROM: the master bedroom and great room (with stone see through fireplace), fitness all-all season room, dining room (other side of fireplace) - and the lower level. Huge deck to take in the views and entertain your friends and family. Hardwood floors, and walls of windows to take in the views. Private master suite was built to take in the views, and opens to a sunroom which overlooks the mountains, adjacent to the great room and loft area. Dumb waiter in the garage for groceries, plus home is handicap accessible with a chairlift on lower stairs that can easily be removed if necessary. Complete w/ hot tub! 2-car garage, plus a parking pad on the upper level. Vacation rental company estimates rev $1595-1795 per weekVideo available. Offered by Allstar Powerhouse. Copyright 2019 Carolina Multiple Listing Services. All rights reserved.